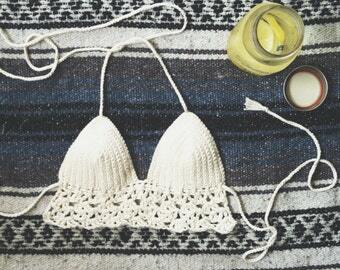 This hand crocheted lacy bikini bralette is a must have for summer. Wear in the water, or as a bralette with your favorite low cut summer dresses and blouses. Cotton crochet is meant for water wear, it retains its shape however it does take longer to dry than normal swim materials. Made from %100 USA made cotton in your choice of Seafoam (pictured, Shell is also pictured) or your choice from the drop down menu. This top features decoratively attached cups, crochet lace details, and string ties around the neck and bodice that allow for a more customized fit. Model is a US 32A wearing the XS/S top in sea foam and the S/M top in shell.